Free Shipping Included! 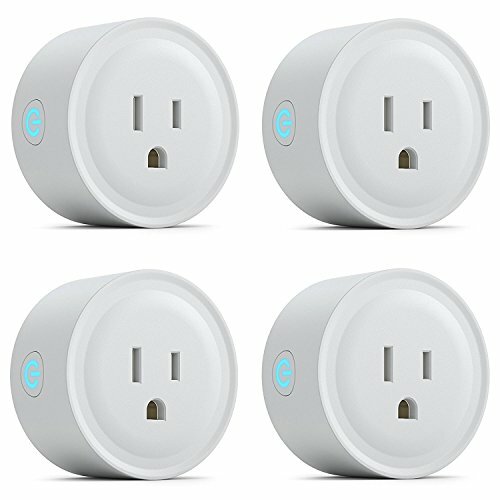 Wifi Smart Plug Mini Smart Outlet Socket Voice controlled by Alexa, Echo, Google Home and IFTTT, Wifi Plug with Timer and Countdown, App Remote Control Anywhere, No Hub Required, 3 Pack (4 pack) by Magic-shop at Elect Forum. Hurry! Limited time offer. Offer valid only while supplies last. The smart plug could be alexa voice controlled,and set scheduled as you need, and app remote control anywhere, easy to install, no hub required. The smart plug could be alexa voice controlled,and set scheduled as you need, and app remote control anywhere, easy to install, no hub required. . If the devices connected with smart outlet, one App will control all .You can also create a group for all devices and control them with one command.We could share the smart plug with family. "If This, Then That" is a free web-based service that lets you have more fun with Wifi Plug. Smart plug timer helps lower your electricity bill by keeping power-hungry devices off when they are not needed. You can use wifi plug to give the appearance that someone is at home so nobody dares to come in when you are not at home. With smart outlet, you can control the computer or TV to turn off when they should be doing homework. Note: Please keep in mind that the "Smart Life" app should be set up already before setting up with Alexa or Google. *Please make sure operating current within 10A . 【Voice Controlled Smart Plug】: There is no need to walk to turn off lamp when you're already in bed, you just say "turn off the light" if the mini wifi plug paired with your Alexa or Google Home. Smart outlet make your life convenient. 【App Remote Controlled Smart Outlet】: Sometimes we are not at home, but we want to control the home devices outside, so we could connect the appliance with the smart plug then turn on/off them throught the app. (Wifi plug is compatible with iOS 8 and up, Android 4.1 and up). 【Wifi Plug Set Schedule】 : You could set smart plug to turn on the coffee maker through app at 7:00 am through Timer and Countdown function. And other schedules as your need for smart outlet at certain times. 【Easy to Install Smart Plug and No Hub Require】: Only need 3 steps to set up the smart outlet. The wifi plug works with any Wi-Fi router without the need for a separate hub or paid subscription service. Only support 2.4Ghz. 【Smart Outlet with Secure & Warranty】:Our smart plug is with fire prevention and overload protection , CE &FC Certified . The warranty for wifi plug is 12 Months. Please contact us at any time if you have problems or questions. If you have any questions about this product by Magic-shop, contact us by completing and submitting the form below. If you are looking for a specif part number, please include it with your message.